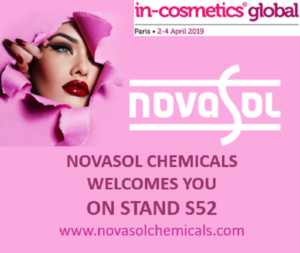 The Novasol Chemicals team is happy to inform you of our participation to the exhibition IN-COSMETICS GLOBAL 2019, to be held in Paris, from Tuesday April 2 to Thursday April 4, 2019. We will welcome you on our stand S52, situated in the Fragrance Zone, to hear more about our innovative set of solutions and services for Personal Care. Looking forward to meeting you soon in Paris. Click here to get your free access badge.